For similar forces in other countries, see Gendarmerie (disambiguation). The National Gendarmerie (French: Gendarmerie nationale [ʒɑ̃daʁməʁi nasjɔnal]) is one of two national police forces of France, along with the National Police. It is a branch of the French Armed Forces placed under the jurisdiction of the Ministry of the Interior—with additional duties to the Ministry of Defense. Its area of responsibility includes smaller towns, rural and suburban areas, while the Police Nationale—a civilian force—is in charge of cities and downtowns. Due to its military status, the Gendarmerie also fulfills a range of military and defense missions. The Gendarmes also have a cybercrime division. It has a strength of more than 100,000 personnel as of 2014. Logo of the National Gendarmerie. The Gendarmerie is heir to the Maréchaussée (Marshalcy—see below), the oldest police force in France, dating back to the Middle Ages. It has influenced the culture and traditions of gendarmerie forces all around the world—and especially in the former French colonial empire. The Gendarmerie is the direct descendant of the Marshalcy of the ancien regime, more commonly known by its French title, the Maréchaussée. During the Middle Ages, there were two Grand Officers of the Kingdom of France with police responsibilities: The Marshal of France and the Constable of France. The military policing responsibilities of the Marshal of France were delegated to the Marshal's provost, whose force was known as the Marshalcy because its authority ultimately derived from the Marshal. The marshalcy dates back to the Hundred Years War, and some historians trace it back to the early twelfth century. Another organisation, the Constabulary (French: Connétablie), was under the command of the Constable of France. The constabulary was regularised as a military body in 1337. In 1415 the Maréchaussée fought in the Battle of Agincourt and their commander, the "Prévôt des Maréchaux" (Provost of the Marshals), Gallois de Fougières, was killed in battle. His existence was rediscovered in 1934. Gallois de Fougières was then officially recorded as the first known gendarme to have died in the line of duty and his remains are now buried under the monument to the gendarmerie in Versailles. Under King Francis I (French: François Ier, who reigned 1515–1547), the Maréchaussée was merged with the Constabulary. The resulting force was also known as the Maréchaussée, or, formally, the Constabulary and Marshalcy of France (French: connétablie et maréchaussée de France). Unlike the former constabulary the new Maréchaussée was not a fully militarized force. While its existence ensured the relative safety of French rural districts and roads, the Maréchaussée was regarded in contemporary England, which had no effective police force of any nature, as a symbol of foreign tyranny. English visitors to France saw their armed and uniformed patrols as royal soldiers with an oppressive role. In 1789, on the eve of the French Revolution, the Maréchaussée numbered 3,660 men divided into small brigades (a "brigade" in this context being a squad of ten to twenty men). Their limited numbers and scattered deployment rendered the Maréchaussée ineffective in controlling the "Great Fear" of July-August 1789. During the revolutionary period, the Maréchaussée commanders generally placed themselves under the local constitutional authorities. Despite their connection with the king, they were therefore perceived as a force favouring the reforms of the French National Assembly. As a result, the Maréchaussée Royale was not disbanded but simply renamed as the gendarmerie nationale (Law of 16 February 1791). Its personnel remained unchanged, and the functions of the force remained much as before. However, from this point, the gendarmerie, unlike the Maréchaussée became a fully military force. During the revolutionary period, the main force responsible for policing was the National Guard. Although the Maréchaussée had been the main police force of the ancien regime, the gendarmerie was initially a full-time auxiliary to the National Guard militia. In 1791 the newly named gendarmerie nationale was grouped into 28 divisions, each commanded by a colonel responsible for three départements. In turn, two companies of gendarmes under the command of captains were based in each department. This territorial basis of organisation continued throughout the 19th and 20th centuries. Under Napoléon, the numbers and responsibilities of the gendarmerie, renamed gendarmerie impériale, were significantly expanded. In contrast to the mounted Maréchaussée, the gendarmerie comprised both horse and foot personnel; in 1800 these numbered approximately 10,500 of the former and 4,500, respectively. In 1804 the first Inspector General of Gendarmerie was appointed and a general staff established—based in the rue du Faubourg-Saint-Honoré in Paris. Subsequently, special gendarmerie units were created within the Imperial Guard, and for combat duties in French occupied Spain. Following the Second Restoration of 1815, the gendarmerie was reduced in numbers to about 18,000 and reorganised into departmental legions. Under King Louis Phillippe a "gendarmerie of Africa" was created for service in Algeria and during the Second Empire the Imperial Guard Gendarmerie Regiment was re-established. The majority of gendarmes continued in what was now the established role of the corps—serving in small sedentary detachments as armed rural police. 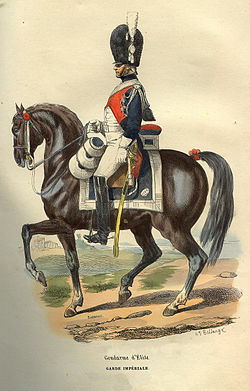 Under the Third Republic the ratio of foot to mounted gendarmes was increased and the numbers directly incorporated in the French Army with a military police role reduced. In 1901, the École des officiers de la gendarmerie nationale was established to train its officers. Taguin (1843): Thirty gendarmes on horseback were mobilised to take part in tracking the tribe of the emir Abd-El-Kader and participated in his capture. In a painting by Horace Vernet, which immortalises the scene (and hangs in the Musée de Versailles), the gendarmes appear alongside the Algerian Governor-General, Henri d'Orléans, duc d'Aumale. The gendarmerie is still sometimes referred to as the maréchaussée (the old name for the service). The gendarmes are also occasionally called pandores, which is a slang term derived from an 18th-century Hungarian word for frontier guards. The symbol of the gendarmerie is a stylized grenade, which is also worn by the Italian Carabinieri and the Grenadier Guards in Britain. The budget in 2008 was approximately 7.7 billion euros. The Gendarmerie, while remaining part of the French armed forces, has been attached to the Ministry of the Interior since 2009. Criminal investigations are run under the supervision of prosecutors or investigating magistrates. Gendarmerie members generally operate in uniform, and, only occasionally, in plainclothes. The Director-general of the Gendarmerie (DGGN) is appointed by the Council of Ministers, with the rank of Général d'Armée. The current Director-General is Général Richard Lizurey who took office on September 1, 2016.
at the operational level. The DGGN is in charge of plans, operations, procurement, training and support of the forces in the field. in an advisory position for government in all matters pertaining to the Gendarmerie. The Gendarmerie headquarters, called the Directorate-General of the National Gendarmerie (Fr: Direction générale de la Gendarmerie nationale (DGGN)), long located in downtown Paris, had been relocated since 2012 to Issy-les-Moulineaux, a southern Paris suburb. The Republican Guard — organized as a separate military corps in one cavalry and two infantry regiments (all three battalion-sized) and specialized units for training and logistical support. It provides protection and ceremonial guard for the President of The Republic, the Prime Minister, their official residencies and both chambers of the French Parliament. The Overseas Gendarmerie — in charge of French overseas departments and territories, bringing together the different gendarmerie branches under unified commands in the respective overseas territories. It is also tasked with providing security to the French embassies and consulates overseas. Air Gendarmerie — military police for the French Air Force and crash scene investigations involving French military aircraft under the dual subordination of the National Gendarmerie and the Air Force. Maritime Gendarmerie — military police for the French Navy and coast guard under the dual subordination of the National Gendarmerie and the Navy. Air Transport — security force for the civil aviation under the dual subordination of the National Gendarmerie and the Ministry of Transportation. Ordnance Gendarmerie — security and counter-intelligence force for the Direction générale de l’armement (DGA), the armament and equipment procurement, development and maintenance agency of the French Ministry of Defence. Nuclear ordnance security — security force for the French nuclear arsenal directly subordinated to the Minister of Defence. (The security of the civil nuclear powerplants and research establishments is provided by specialised units of the Departmental Gendarmerie). The Provost Gendarmerie — military police for overseas deployments. 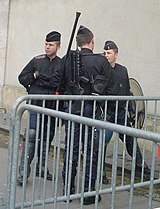 (The functions of military police for the French Army on French soil are fulfilled by units of the Mobile Gendarmerie). Intervention Group of the National Gendarmerie (GIGN): One of the two premier Counter-terror formations of France. Its counterpart within the National Police is the RAID. Operatives from both formations make up the protective detail of the French President (the GSPR). Operational support formations, such as the Gendarmerie air service, the forensic teams, high mountain rescue platoons, canine units, riverine, lake and diver support units etc. The above-mentioned organizations report directly to the Director General (DGGN) with the exception of the Republican Guard, which reports to the Île-de-France region. The reserve force numbers 25,000 (not included in the 100,000 total). It is managed by the Departmental Gendarmerie at the regional level. The Departmental Gendarmerie, or Gendarmerie Départementale, also named «La Blanche» (The White), is the most numerous part of the Gendarmerie, in charge of police in small towns and rural areas. Its territorial divisions are based on the administrative divisions of France, particularly the departments from which the Departmental Gendarmerie derives its name. The Departmental Gendarmerie carries out the general public order duties in municipalities with a population of up to 20 000 citizens. When that limit is exceeded, the jurisdiction over the municipality is turned over to the National Police. It is divided into 13 metropolitan regions (including Corsica), themselves divided into groupements (one for each of the 100 département, thus the name), themselves divided into compagnies (one for each of the 342 arrondissements). Brigade groups composed of smaller brigades supervised by a larger one (COBs). Surveillance and intervention platoons (PSIGs), who conduct roving patrols and reinforce local units as needed. In addition, the Gendarmerie runs a national criminal police institute (Institut de recherche criminelle de la gendarmerie nationale) specializing in supporting local units for difficult investigations. The research units may be called into action by the judiciary even within cities (i.e. in the National Police's area of responsibility). As an example, the Paris research section of the Gendarmerie was in charge of the investigations into the vote-rigging allegations in the 5th district of Paris (see corruption scandals in the Paris region). Gendarmes normally operate in uniform. They may operate in plainclothes only for specific missions and with their supervisors' authorisation. The Mobile Gendarmerie, or Gendarmerie Mobile, also named « La Jaune » (The Yellow), is currently divided into 7 Defense zones (Zones de Défense). It comprises 18 Groupings (Groupements de Gendarmerie mobile) featuring 109 squadrons for a total of approx. 12,000 men and women. Nearly 20% of the Mobile Gendarmerie squadrons are permanently deployed on a rotational basis in the French overseas territories. Other units deploy occasionally abroad alongside French troops engaged in military operations (called external operations or OPEX). 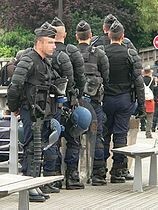 the CRS wear a big red CRS patch; the gendarmes have stylised grenades. The Mobile Gendarmerie includes GBGM (Groupement Blindé de la Gendarmerie Nationale), an Armoured grouping composed of seven squadrons equipped with VXB armoured personnel carriers, better known in the Gendarmerie as VBRG (Véhicule Blindé à Roues de la Gendarmerie, "Gendarmerie armoured wheeled vehicle"). It is based at Versailles-Satory. The unit also specializes in CBRN defense. 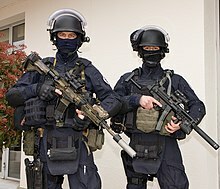 GIGN (Groupe d'intervention de la Gendarmerie nationale) is an elite law enforcement and special operations unit numbering about 400 personnel. Its missions include counter-terrorism, hostage rescue, surveillance of national threats, protection of government officials and targeting of organized crime. Many of its missions are classified, and members are not allowed to be publicly photographed. Since its formation, GIGN has been involved in over 1,800 missions and rescued more than 600 hostages, making it one of the most experienced counter-terrorism units in the world. The unit came into prominence following its successful assault on a hijacked Air France flight at Marseille Marignane airport in December 1994. Guarding important public buildings in Paris such as the Élysée Palace, the residence of the Prime Minister of France, Hôtel Matignon, the Senate, the National Assembly, the Hall of Justice, and keeping public order in Paris. The non-metropolitan branches include units serving in the French overseas départements and territories (such as the Gendarmerie of Saint-Pierre and Miquelon), staff at the disposal of independent States for technical co-operation, Germany, security guards in French embassies and consulates abroad. assistance and rescue at sea. judiciary inquiries pertaining to accidents of civilian aircraft. The Air Gendarmerie (Gendarmerie de l'Air) is placed under the dual supervision of the Gendarmerie and the Air Force, it fulfills police and security missions in the air bases, and goes on the site of an accident involving military aircraft. The Ordnance Gendarmerie (Gendarmerie de l'Armement) fulfills police and security missions in the establishments of the Délégation Générale pour l'Armement (France's defence procurement agency). As the name implies, this branch is in charge of all security missions pertaining to France's nuclear forces. The Provost Gendarmerie (Gendarmerie prévôtale), created in 2013, is the military police of the French Army deployed outside metropolitan France. 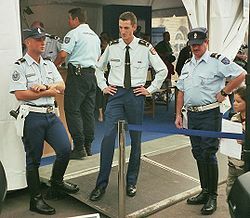 The uniform of the Gendarmerie has undergone many changes since the establishment of the corps. Throughout most of the 19th century a wide bicorne was worn with a dark blue coat or tunic. Trousers were light blue. White aiguillettes were a distinguishing feature. In 1905 the bicorne was replaced by a dark blue kepi with white braiding, which had increasingly been worn as a service headdress. A silver crested helmet with plume, modelled on that of the French cuirassiers was adopted as a parade headdress until 1914. Following World War I a relatively simple uniform was adopted for the Gendarmerie, although traditional features such as the multiple-cord aiguillette and the dark blue/light blue colour combination were retained. Since 2006 a more casual "relaxed uniform" has been authorised for ordinary duties (see photograph below). The kepi however continues in use for dress occasions. Special items of clothing and equipment are issued for the various functions required of the Gendarmerie. The cavalry and infantry of the Republican Guard retain historic ceremonial uniforms dating from the 19th century. Riot control gear: body armour, shield, tear gas mask, apparatus for throwing tear gas canisters. 40,000 reserve personnel. This reserve force had not yet reached the authorised size limit. Only 25,000 men and women were signed up for reserve engagements (E.S.R.). 21 Centers for Information and Recruitment. 23 schools and Instruction Centers. The Gendarmerie nationale's Prospective Centre (CPGN), which was created in 1998 by an ordinance of the Minister for Defence, is one of the gendarmerie's answers to officials' willingness to the modernise the State. Under the direct authority of the general director of the gendarmerie, it is located in Penthièvre barracks on avenue Delcassé in Paris and managed by Mr Frédéric LENICA, (assisted by a general secretary, Colonel LAPPRAND) "maître des requêtes" in the Conseil d'Etat. The Gendarmerie has used helicopters since 1954. 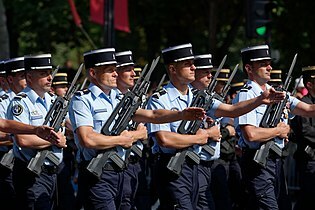 They are part of the Gendarmerie air forces (French: Forces aériennes de la Gendarmerie or FAG—not to be confused with the Air Gendarmerie or the Air Transport Gendarmerie). FAG units are attached to each of the seven domestic "zonal" regions and six overseas COMGEND (Gendarmerie commands). They also operate for the benefit of the National Police which owns no helicopters (the Police also has access to Civil Security helicopters). Forces aériennes de la Gendarmerie (FAG) operate a fleet of 55 machines belonging to three types and specialized in two basic missions: surveillance/intervention and rescue/intervention. ^ a b c MEMOGENDV6 information brochure edited by SIRPA-G, the Gendarmerie information bureau. The 100,000 figure includes approx 3,600 civilians. ^ Brown, Howard G. Ending the French Revolution. pp. 189–190. ISBN 978-0-8139-2729-9. ^ Schama, Simon. Citizens. A Chronicle of the French Revolution. p. 430. ISBN 0-670-81012-6. ^ "2008 Budget Bill, French Senate". Senat.fr. 2010-12-21. Archived from the original on 2017-06-06. Retrieved 2017-09-07. ^ After the colour of the silver stripes that the gendarmes wear on their kepis, as opposed to the golden stripes of the Mobile Gendarmerie. ^ "Comment sont définies les zones police et gendarmerie - Le Parisien". Leparisien.fr. Archived from the original on 2017-09-08. Retrieved 2017-09-07. ^ Since 2016, metropolitan France has been divided into 12 administrative regions. ^ Peachy, Paul. "Who are GIGN? Elite police force formed after 1972 Olympics attack on Israelis". The Independent. The Independent. Archived from the original on 31 May 2016. Retrieved 27 April 2016. Gilbert MAUREL "la guerre d'un gendarme en Algérie" ed L'Harmattan. ISBN 978-2-336-00943-8. Wikimedia Commons has media related to Gendarmerie (France).